Sir Richard Branson is at it again—whether it’s luxurious trips to outer space or stylish underwater adventuring, the Virgin Mobile tycoon wants to be the first to market it. 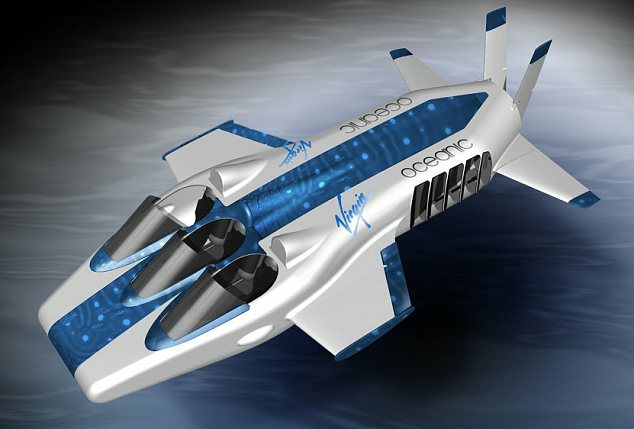 Virgin Limited Edition announced today it will be going underwater with its new Necker Nymph aero submarine. The Necker Nymph a DeepFlight three-person aero submarine. Graham Hawkes of Hawkes Ocean Technologies, engineer and designer behind the Necker Nymph, likened this open cockpit winged sub to an underwater aircraft. I’ve long believed that a full and rich life should be an unending set of adventures and I do my best to lead by example and live a life of unending adventure. Adventures enable my pursuit of profound joy, both for myself and for those I’m privileged to be with. Adventures can be of any length and happen at any time in any place as they span an immense spectrum from single moments to multi year activities. A moment of awe when find your eyes mutually locked with those of a newborn child, being there at just the right moment to help someone in crisis, witnessing mother nature in her full and furious forms and the list goes on. I am very much a journey person vs a destination person as for me the journey IS the destination. I found myself reflecting upon journeys and adventures when I ran across the article above about Sir Richard’s latest “toy” and this emerging type of “underwater plane” which I’ve been following for some time. Water, the word’s oceans in particular, have become increasingly fascinating to me as I continue what will likely be a circumnavigation of the globe aboard my sailboat Learnativity. (currently in Whangarei New Zealand at 35°43'24.04"S 174°19'29.98"E) And I find myself thinking about future adventures and have been thinking it would be a fun set of adventures to singlehanded circumnavigate the globe on land, sea and air. Now I may need to add a fourth to this of circumnavigating underwater as well. The underwater plane below isn’t going to quite do it for me as it only goes for an hour or so at a time but I’m sure that by the time I’m ready it will be or I can make one that is. In the meantime, have fun wondering and pondering the possibilities Sir Richard’s newest toy conjures up and adds to my list of What if the impossible isn’t?